Meat microbiology is the study of organisms in Meat, their functions, and how they affect meat properties. Microorganisms in meat are important because they affect meat Quality and storage. The purpose of microbiological testing is to determine the degree of bacterial contamination on surfaces of equipment, tools, premises as well as in meat and meat products. This testing can be done qualitatively as microbiological screening, for example by contact such as using an impression plate or quantitatively by determining the exact number of microorganism per sample unit (in cm2 or grams) by using the swab or the destructive method. 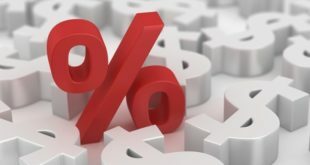 Quantitative testing can be either determination of the entire contaminating flora, also called “total plate count” or determination of a specific group of microorganisms out of the entire flora, also called “selective plate count”. 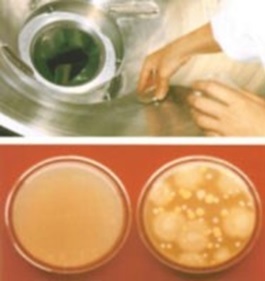 The microbiological culture medium is put in direct contact with the surface of equipment or tools to be tested (Fig. 438 a,b). Microbes contaminating the surface are removed from there as they adhere to the sticky culture medium. 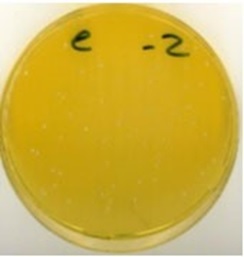 The culture medium containing the microbes from the test surface is incubated e.g. at 30°C for 2 days. Each bacterium grows as a bacterial colony visible to the naked eye. Colonies can be counted to allow assessment of the degree of contamination. Advantage: Simple procedure, can be carried out without laboratory. Disadvantage: In case of heavy contamination, colonies may overgrow/overlap and individual colonies are difficult or impossible to distinguish. Result in this latter case would be “heavy contamination”, but conclusion on the exact degree is not possible. New commercially available systems for the contact plate technique facilitate the application and provide more accurate results. The culture medium is attached to a plastic chip, which has a flexible hinge for better handling. 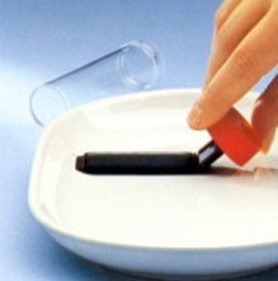 The test chip is placed in a fitting sterile plastic tube upon surface testing and incubated (Fig. 438c). Results are available after 24 hours when using incubation temperatures of 35-37°C. Areas not accessible for the direct impression, e.g. inside equipment, can be tested by using a swab, and the impurities gathered are transferred to the culture medium (Fig. 438d). 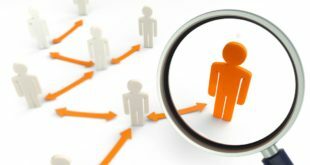 The method allows approximate quantitative microbial testing by comparing the test results with reference microbial growth schemes provided by the supplier. a)Impression on test surface (purple colour). 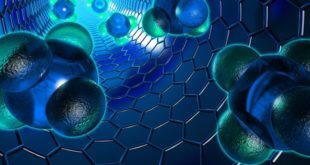 In this context, it should be mentioned, that rapid control systems, which provide immediate results on the cleanliness of surfaces, are based on detection of metabolic substances (ATP or NAD) originating from bacterial growth. 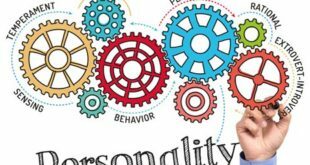 The systems, which were developed to check the immediate effect of sanitation in large food industries, are of less relevance for small to medium industries and can be costly. Contaminating bacteria are removed from the surface to be tested by using a sterile swab. Standardization by using a reference square area is needed (e.g. by sterile metal frame) (see Fig. 439). Microorganisms collected by the swab technique are rinsed off with sterile water (see Fig. 440). The microbial content of the liquid is tested. Advantage : Even in case of heavy contamination, the number of microorganisms can be determined by applying dilution techniques (see page 335). Fig. 440:Swab method. 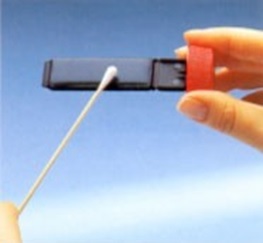 Bacteria to collection with swab on board. transfer of solution on culture medium. 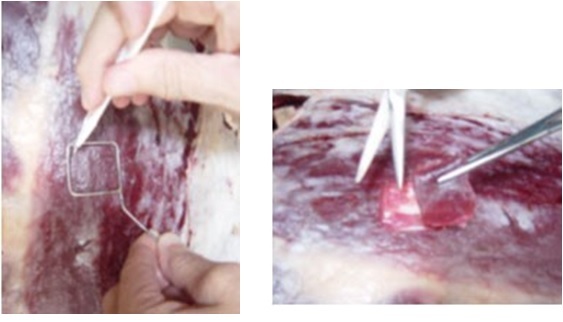 A standardized sample is cut out (“destructive”) from the surface of meat or meat products, for example by using a sterile knife and metal frame (Fig. 441, 442). The sample received, which has a defined surface area, is further standardized by removing tissue from the bottom layer until a standardized weight (e.g. 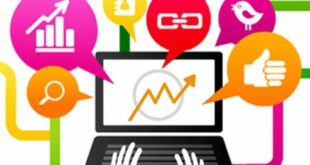 10g) (Fig. 443) is achieved. Advantage: The testing includes all microorganisms present in the sample. Samples can be exactly standardized according to surface area (cm2) or weight (g). The sample comprises not only superficial contamination, but also microorganisms from the interior of meat/meat products. The meat sample is homogenized in sterile water by using laboratory equipment (“Stomacher”) (Fig. 444). Transfer of homogenized solution on culture medium is by dilution techniques (see page 335). Pipette 1 ml from 3rd dilution and transfer to the sterile petridish, also from the 4th dilution to another sterile petridish depends upon how many dilutions are desired (see below and Fig. 445). 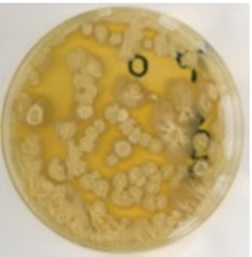 The inoculation is usually done according to the spread plate method. The diluted sample is released from the pipette onto the solidified agar and spread on the surface by means of a sterile bent glass stick. 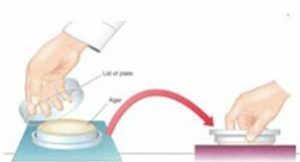 The alternative is the pour plate method, where the sample is first put into the Petri dish and 15 ml agar (liquefied in a water bath at 44-46°C) are poured into the plate afterwards. Agar and sample are thoroughly mixed by rotating the Petri dish. Incubate for 12 to 24 hours at 35 to 37°C, alternatively 24-48 hours at 30°C. Count all colony forming units (CFU), including those of pinpoint size (Fig. 446). Select spreader-free plate. The total plate count is a good indicator for the overall bacterial load of meat and meat products. Critical hygienic dimensions are reached when the total number of bacteria on fresh meat lays between 10,000 (1,0×104) and 100,000 (1,0×105) per g (see also page 353). However, the total number does not allow any conclusions on the nature of the microorganisms, i.e., if the bacteria are harmful or harmless. Therefore, practicable microbiological standards should, in addition to the total plate count, always include the number of hygienically sensitive microorganisms, which can be used as an indicator for specific hygienic risks. These microorganisms are selected out of the total number of bacteria. 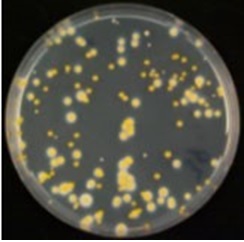 This can be done using selective bacterial culture media, which contain chemical additives that suppress the growth of all bacteria except the group of microorganisms that shall be detected and used as indicator bacteria. 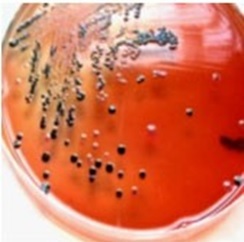 The indicator bacteria most commonly used is the group of Enterobacteriaceae. Enterobacteriaceae are part of the intestinal microflora, i.e. they are present in high numbers in the faeces of humans and animals. Most importantly, harmful food poisoning bacteria belong to this group e.g., pathogenic E.coli and Salmonella. If larger numbers of Enterobacteria are found in food, there is the probability of massive contamination with dirt or even faecal material with all the consequences, in particular presence of food poisoning bacteria. The number of Enterobactericeae should not exceed 100 per cm for the criterion “good microbiological standard” (see also page 353). 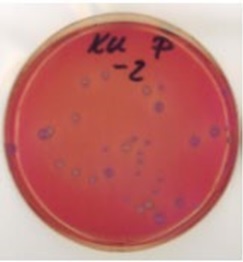 The selective culture medium used for the determination of Enterobactericeae is the Violet Red Bile Agar (VRB), which contains Crystal violet and bile salt for the inhibition of all other bacteria (Fig. 447). Other commonly used selective culture media are Lactobacilli MRS Agar for the isolation of Lactobacillus (Fig. 448), BAIRD-PARKER Agar for the isolation of Staphylococcus aureus (Fig. 449), XLT4 for the isolation of Salmonella (Fig. 450) and Mc Conkey Agar for the isolation of moulds (Fig. 451) (see also page 356, 357, 359). Microbiological detection kits are now on the market, which deliver screening results without the need of a laboratory. Such kits are particularly designed for the detection of pathogens such as Salmonella, Listeria or E. coli O157 H7. They indicate presence or absence of bacteria by change of colour on test strips submerged in a liquid suspension of materials to be tested.